AS the Birmingham Comedy Festival gets under way next week, three local acts are hoping to stand out from among some of the more well-known performers. Louise Stokes, Lee Dempsey and Jo Enright are all Birmingham comedians performing at the Crescent Theatre on Sunday October 5. They are all part of the 'Birmingham Comedy Selection' and believe they have something special to differentiate them from your usual comedy performers. Lee Dempsey, from Solihull, is performing his unique solo act 'The Stand In'. "Comedy tends to have an exclusively adult reputation when live, but we are hoping to embrace all ages of audience in our show," Lee says. 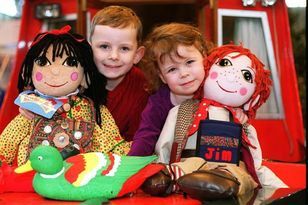 "'The Stand In' genuinely appeals to everyone and is suitable for children without being in any way a kids or a yucky family show, and Louise Stokes' characters are silly enough for youngsters to enjoy. "Likewise Jo Enright has a wide appeal without being offensive, so it's fairly safe to bring all ages along - not many show you could say that about - without compromising on quality of laughs!" The evening of comedy begins at 7pm, tickets from The Crescent box office on 0121 643 5858 or www.crescent-theatre.co.uk.